As earlier blog posts showed, public discourse about drugs and addiction changed from focusing on morality and personal responsibility during the 19th century to a focus on culture and racial identity during the early 20th century. When drugs and addiction are discussed today, we often hear that criminal justice reform and electoral politics are the central issues influencing the course of addiction and the treatment of addicts in our society. 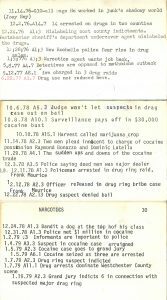 The White Plains Collection has many resources you can use to discover what happened during the 1960s as the modern era of “drug culture” developed and what people were thinking when the War on Drugs began in the 1970s. 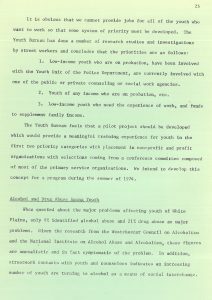 By the mid-1960s, forward thinking people in the medical and criminal justice fields saw a need to treat drug use and addiction as a distinct area of study. It could no longer simply be lumped in with mental illness or criminal activity. The White Plains Collection contains a number of studies from the mid-1960s forward. 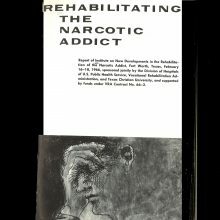 “Rehabilitating the Narcotic Addict” is a 1966 report published by the US Department of Health, Education and Welfare. 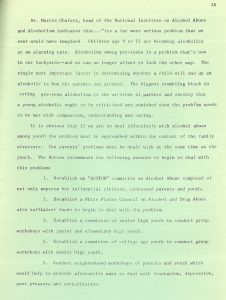 It is an extensive study of the programs at hospital in Lexington and Fort Worth that were the only publicly funded examples of treatment for addiction from their establishment in 1929 through the late-1960s. 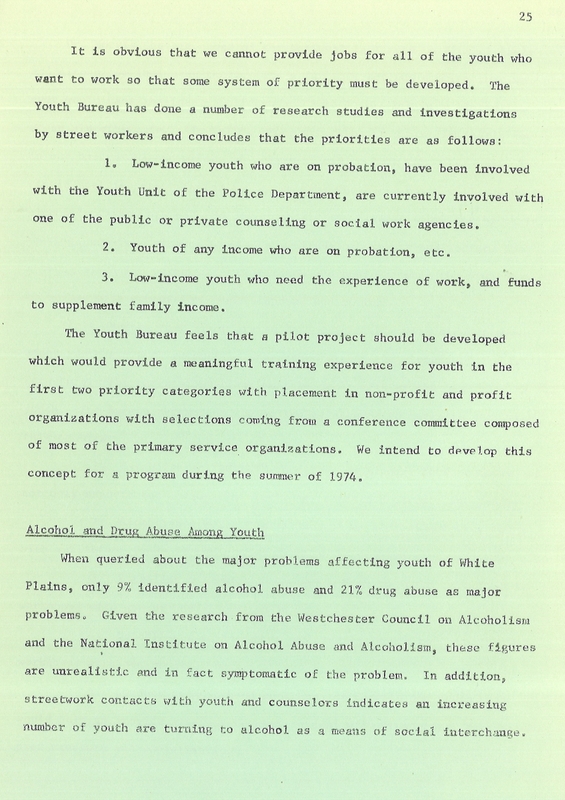 The authors note the shift from individualized treatment based on psychiatry to “group approaches and toward what is called social psychiatry or milieu treatment.” A 1973 report called “Special Needs of Youth in the City of White Plains” demonstrates the influence of earlier research and policies. 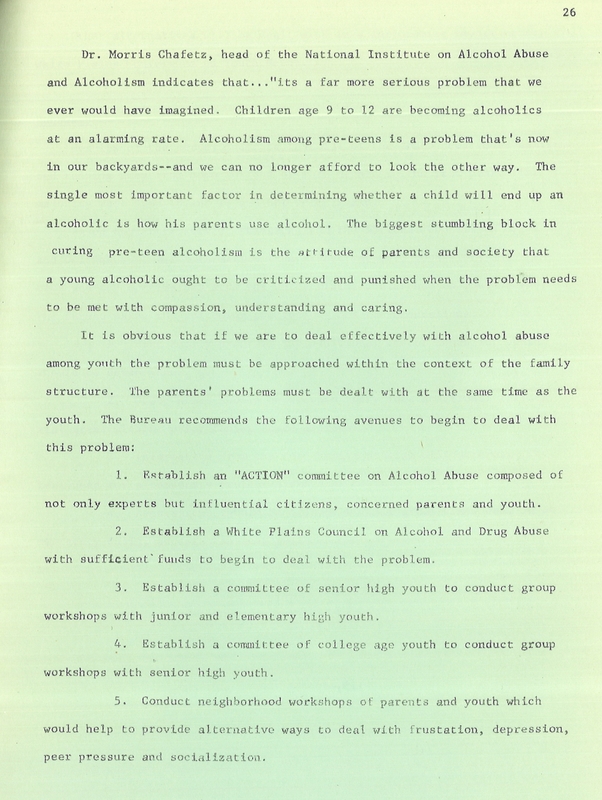 Less than ten years after the federal government released “Rehabilitating the Narcotic Addict,” the Youth Services Bureau asserted that drug use by teens “must be approached within the context of the family structure.” The report reflects a level of open-mindedness that was almost inconceivable a decade earlier. It acknowledges the importance of including young people in the development of any programs intended to help them. But young people are one thing, adults another. 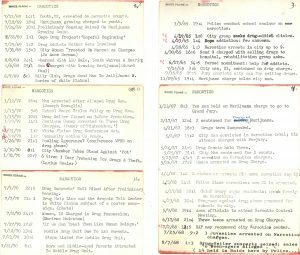 Browsing through headlines from the Reporter Dispatch during the early to mid 1960s reveals the most popular narratives that competed for supremacy. 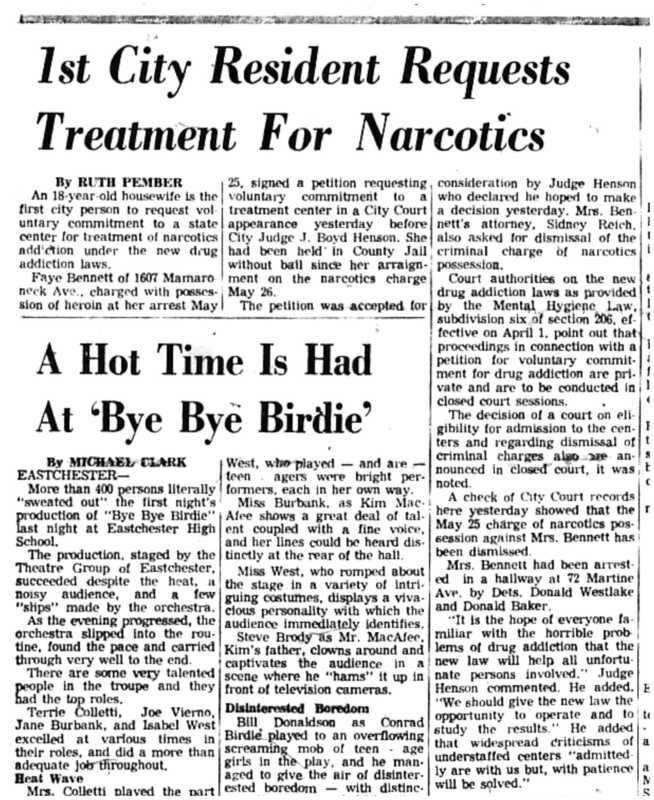 On one hand, an aide to the district attorney in Westchester reported that “Drug Addiction Is On Wane” in 1964, even though a story four months later proclaimed “alarming” levels of drug use “among youth in Yonkers.” That drug use and addiction (as well as crime associated with both) became more frequent in the 1960s is not debatable. What is up for discussion is how society reacted. For a vivid illustration of the rise in police actions related to drugs, read through these indexed articles from the White Plains Collection. 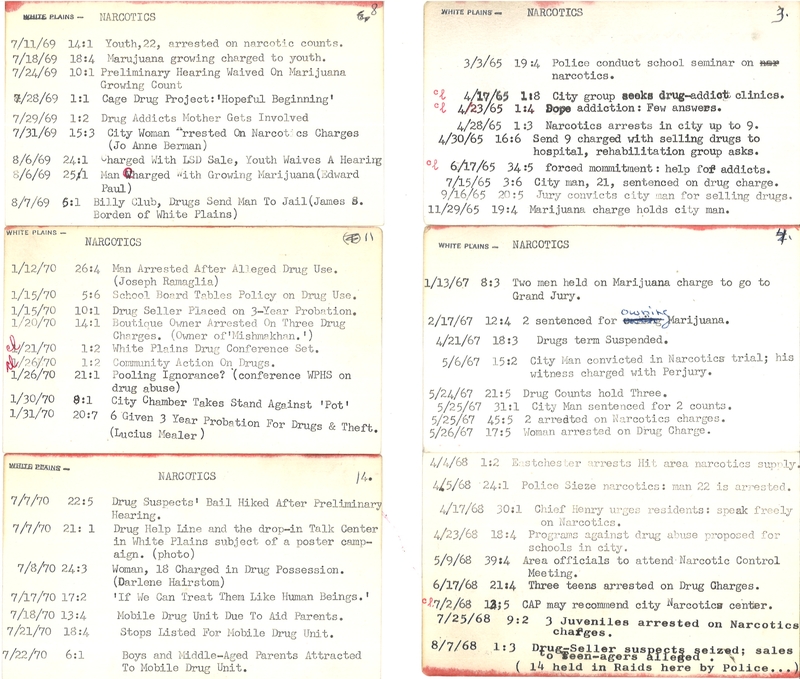 “Narcotics” was a subject heading in the card index maintained by librarians since the 1930s, but it was only in the mid-1960s that a steady stream of articles in the Reporter Dispatch developed. Before then, whole years would pass without a story being indexed under the “Narcotics” subject heading. The increase in police activity itself and public calls for policy to address what was either a public health crisis or a wave of criminality (depending on who you asked) produced outcomes that continue to be in tension today. 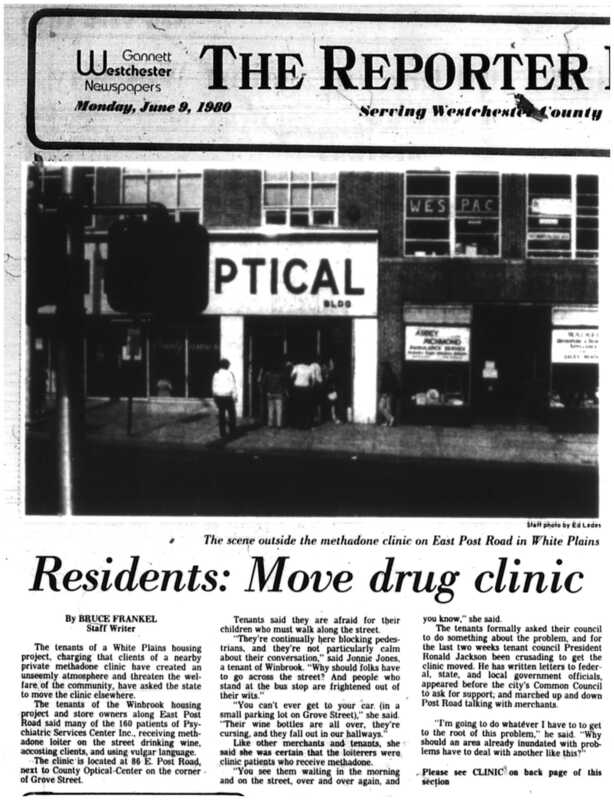 As early as 1965, a citizens group in White Plains wanted to open a clinic for drug addicts in the city. The next year, there was a “panel to discuss LSD” at a local church. 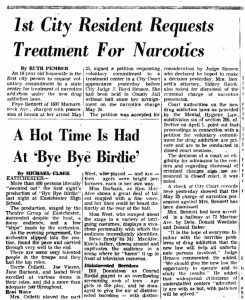 By 1967, it was reported that “1st City Resident Requests Treatment for Narcotics” under the state's new Mental Hygiene Law. Two years later, a man had his drug-related charges dropped after he committed himself for treatment. Parallel to progressive initiatives to raise awareness and make treatment available, another stream of public discourse was developing. As drug culture and drug use proliferated, a powerful, public demand for police-based action was taken up by politicians (like Nelson Rockefeller) who in turn influenced debate and policy–with consequences that are still felt today. 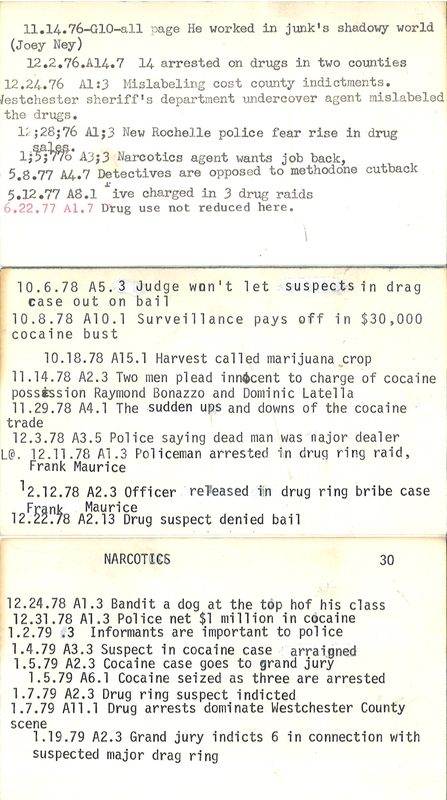 The second week of June 1980 provided a bumper-crop of drug-related news. 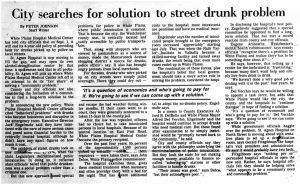 On June 10, the Reporter Dispatch ran articles about injuries Richard Pryor sustained in an incident related to freebasing cocaine and warnings from a UCLA professor that freebase cocaine would become the “epidemic of the decade.” On June 12, Ronald Jackson, the president of the Winbrook Tenants' Council, announced plans to hold a demonstration later in the week. He said residents of Winbrook and their supporters would march down Grove and Grand Streets to voice their opposition to the presence of a methadone clinic on East Post Road and “drug dealing, prostitution, and numbers rackets” which took place in and around the housing complex. While only 15 of the clinic's 375 patients were residents of Winbrook, residents stated that many more addicts used the apartment buildings and loitering around the clinic was leading to public safety issues. Mayor Alfred Del Vecchio sided with the tenants' council, calling for the state to relocate the clinic away from a residential area. 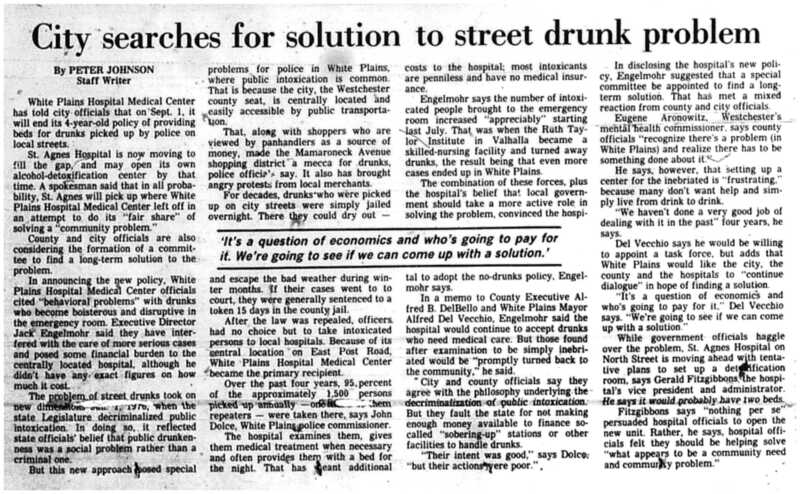 He did not go as far as Jackson in his criticisms, who pointedly stated that a methadone clinic “wouldn't be in Scarsdale.” An article the same week reported that White Plains Hospital would no longer accept people brought in by the police for public intoxication (which had been decriminalized in 1976). The Executive Director of the hospital said unless intoxicated people needed medical attention, they would be “promptly turned back to the community.” In the case of the methadone clinic and the public intoxication problem, political leaders and community members often cast blame on each other or other levels of government for the issues. At the hospital, it was the state government's fault for not providing funds to create alternatives to hospitalization or incarceration for intoxicated people. At Winbrook, tenants cited White Plains' police lack of attention to conditions at Winbrook and the failure of treatment centers to control patients' lives outside the clinics. As Michael Fortner showed in Black Silent Majority: The Rockefeller Drug Laws and the Politics of Punishment, the tension between treatment and punishment was nowhere more vivid than in the political forces that brought some of the nation's strictest drug laws into existence. The Rockefeller Drug Laws of 1973 set the course for national drug policy for the next thirty years by instituting mandatory minimum sentences and increasing the role of police in dealing with addicts and addiction. Fortner focuses on the nexus of white politicians and black leaders that “supported the regulation and removal of the poor, whom they blamed for urban blight and violence in the streets.” It was a similar blend of forces that led to the conflict over a treatment facility in White Plains in June 1980 and a police operation that arrested a number of people and charged them with drug-related offenses in August 1980. The people arrested and sent to prison under the harsher drug policies of the last 35 years were caught up in the “carceral turn,” which was the implementation of policies that would “populate and propel the growth of prisons” until the United States had the highest incarceration rate in the world, according to Fortner. Since the 1970s, the back and forth between those favoring treatment and rehabilitation and those who support incarceration and other forms of punishment has continued to be a defining feature of electoral politics at nearly every level of government and a consistent subject of public discourse. As these blog posts covering events over a one hundred year span show, certain situations concerning addicts and addiction have telling historical echoes. 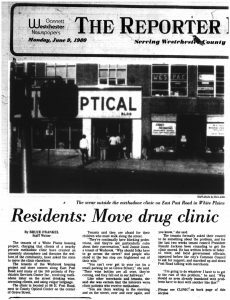 Are there similarities between the complaints of residents in 1894 about the influence of the Keeley Institute on downtown and Winbrook residents' complaints about the methadone clinic on Post Road–and who had the power to make changes based on their complaints? What are the factors that influence how we regard addicts and different types of drugs? Are changing views on marijuana, for instance, the result of reformers' efforts and public education? Or do increasingly liberal views represent a backlash against unsuccessful policies? Who do we ask to deal with drug-related issues–doctors, police, social workers–and what have the results in each case been? These are complex questions that a few blog posts cannot answer. Still, we leave our conversations–both public and private–impoverished if we do not include pertinent historical information. I hope these posts have shown the White Plains Collection is an accessible, locally-focused resource you can use to better understand some of the most complicated issues in our society.